This is an insight of the perfect adventure to the western part of Madagascar. 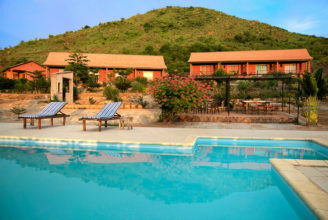 You can tailor made this holiday according to your preferences, speak to our experts today. The trip to the West of Madagascar is the most memorable adventure that you would ever have. You will be amazed by the beauty of the landscape along your journey, a breathtaking scenery, combined with a very warm welcoming people.The West coast of Madagascar is sublime: white and beige-sailed dugouts sparkle on a clear ocean surface, tiny hamlets with welcoming villagers emerge occasionally on the finest beaches lined with oval sand dunes. The rivers form fertile valleys, sometimes almost flat, sometimes sharp and abrupt, but always beautiful. The northern part is mainly a fertile savanna while travelling southwards you will find a drier rather bushy territory with astonishing landscapes. Spectacular limestone promontories called tsingy pile up towards the North, whilst bizarre looking baobabs with immense trunks that would need several people arms to stretch them build fairy-tale forests towards the South. 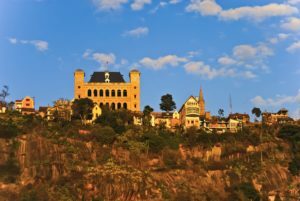 Your adventure to Madagascar starts here, you will be flying to Antananarivo, the capital city. 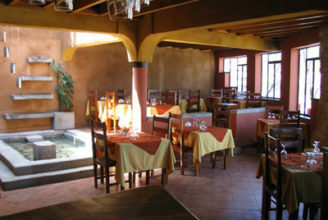 After breakfast you will take a long journey to Miandrivazo. Travel time approximately 7-8 hours. En-route you will visit emerald green Lake Tritriva, one of the two volcanic lakes with legendary tales. The water level drop in the rainy season and rise in the dry season debris from the lake can found down in a valley below, supporting a theory of existing underground channels. Lake Tritriva is situated near the village of Betafo. It’s typical highland village with red houses with red tiled roofs. In the morning at 07:30am you will be transferred to your barge, about an hour. You will be welcomed by the crew. 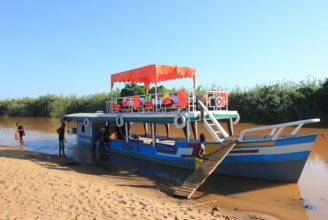 You will cruise along the Tsiribihina River passing beautiful landscape and spotting wildlife and birds including herons, wild ducks, parrots, raptors, kingfishers, chameleons, insects and butterflies. You will have lunch on board. You will stop to rest and discover one of the most beautiful water fall (Nosinapela) in Madagascar with natural swimming pool, if you wish to you can have a refreshing swim. Afterwards you will continue to cruise to village of Begidro. You will visit the Village of Begidro School and walk through the village. You will stop in one of the sand bank island for the overnight camp and dinner. Here you can appreciate one of the most impressive and unique natural sceneries in the world. This cruise will not only help you to get closer to remote villages but also you will be able to switch off from everyday problems and relax. After breakfast you will continue the cruise along the way watch out for flora and fauna. Around midday you will reach the heart of Tsiribihina, here you can see the local villagers use the river for the daily transportation of local products in shapes of boats. You will stop near local village to see the local life and have you lunch, afterwards you will continue your cruise to the Baobab Forest and camp for the night in the sand bank opposite the baobab forest. Evening enjoy camp fire and local music and dance performed by the local village. Last day of your cruise to Belo Tsiribihina, you will be able to see the changing landscape as well as baobab trees. You will arrive in Belo Tsiribihina just after lunch. After lunch in the boat you will continue your journey by road to Bekopaka crossing Manambolo River. Enjoy best of off road 4×4 driving, travel time 4-4:30 hours. In the evening you will meet your guide for the briefing for Tsingy. So you can choose the best suitable for your fit route to hike Tsingy. 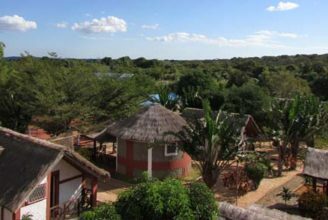 Enjoy a rustic setting with comfortable chalet style accommodation before heading into the park to explore the incredible rock formations and the endemic species of flora and fauna of Madagascar. After early breakfast you will be trekking the Tsingy Bemaraha National Park or Grand Tsingy. It is listed as UNESCO World Heritage Site. This is one of the most spectacular natural landscapes in the world. An extensive area of limestone massif has been eroded into impressive pinnacles Karst. This geological wonder is a monument of Karst limestone that comprises karstic landscapes and limestone uplands cut into impressive ‘tsingy’ peaks and a ‘forest’ of limestone needles, the spectacular canyon of the Manambolo River, rolling hills and high peaks. The undisturbed forests, lakes and mangrove swamps are the habitat for rare and endangered lemurs. There are several circuits to choose from. Prior to trekking your guide will consult you, so you can choose the best circuit that meets your expectation and fitness. Please let you guide know if you are claustrophobic or if you are not comfortable with heights. 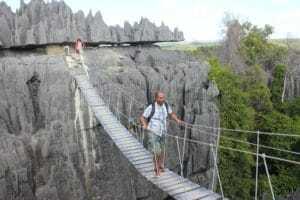 Tsingy Bemaraha is a treasure trove for nature lovers with high rate of endemism and diversity. The scientists estimate that the general endemism of this park is 86.7% and the ecoregional one is 47%. There are 11 species of lemurs including Deken’s Shifakas, red-fronted brown lemur, Cleese’s wooly lemur and more, five families of Bats, 103 species of birds. The index of the reptiles and amphibians is as large as Bemaraha possesses 34 species that are all endemic. These are just a first taste of your discoveries. In the afternoon, you visit the Petit / Small Tsingy: this circuit of 2 hours of duration passes through a labyrinth of limestone and two view points over the impressive pinnacles. There are some good chances to spot the Decken’s sifaka and red-fronted brown lemurs. Early morning, take a pirogue trip on the Manambolo River gorge. This river marks the entry way to the Tsingy. Crossing of the Manombolo River by dugout canoe showcases array of landscapes, gorges and canyons, we will visit the caves. You can look out for the fish eagles, waterfowl, Humblot’s herons and purple herons. In the morning you will travel to Kirindy Reserve and travel time 6 hours. Kirindy is situated 50 km northeast of the town of Morondava, is a privately managed forest by a Swiss company dedicated to a selective and sustainable logging (Centre de Formation Professionelle Forestière). It comprises one of the most outstanding and threatened wildlife habitats in Madagascar: the dry deciduous forest, whose extension has been reduced to 3 per cent of their original extent. Dominated by majestic baobab trees and a forest canopy of even 14 m altitude, this protected area of approximate 100 square kilometres is the only place where the world’s smallest known primate, the giant jumping rat, occurs. This animal can hop like a miniature kangaroo, but is also seen walking on all four limbs. Kirindy is the best place in Madagascar to observe Fossas, especially during the mating time between September and December. It also home to seven species of lemur. The most common are the common brown lemurs and the Verreaux’s sifakas. The remaining species are nocturnal: the rare Coquerel’s giant mouse lemur and pygmy mouse-lemur, fork-crowned lemur, Gray mouse lemur, western fat-tailed dwarf lemur and red-tailed sportive lemur. Several bats, tenrecs, mongooses and rodents complete the mammal population. 40 birds, 50 reptile and 15 amphibian species are also found in this magnificent forest. After arriving to Kirindy you will do a night walk around the reserve to observe the wildlife as they more active in the dawn and dusk. Also you will take a walk spot the nocturnal wildlife around 6pm as it offers the best wildlife spotting experience including Giant jumping rat, lemurs, chameleons and Fossa. In the morning after breakfast you will take short circuit walk for 2-3 hours to spot wildlife inside Kirindy deciduous forest. After lunch you will travel to Morondava stopping at Baobab Avenue. You will visit and admire these age old trees in the Alley of Baobabs or Avenue of the Baobabs en-route to Morondava. This is one of the Madagascar’s picture post card images. Baobabs (Grandidiers) are usually solitary trees, standing tall and proud in the midst of empty spaces. Yet in Baobab Alley, they cluster together forming an avenue of columns that border the dirty road. The Baobabs are tall trees with its massive trucks, crooked branches and furry fruit. Baobabs have adapted to the dry and hostile environment. The secret of the baobab’s success in surviving in harsh environments and the reason for its massive trunk is that it has little wood fibre but a large water storage capacity. Each tree can hold up to 300 litres of water, enabling it to live through long periods without rain. The life-cycle of these unique natural oddities is as impressive as their bulk – most live over 500 years. The best time for photography is in the twilight hours. If time permits, you can admire the sunset on site. 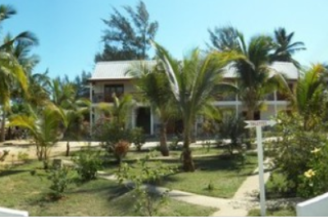 Sun-beach hotel is located in the peninsula of Nosy Tany Kely, a tourist village of Morondava. It offers an exotic stay in an atypical and warm atmosphere to prepare you for the many adventures, the Menabe region has to offer. 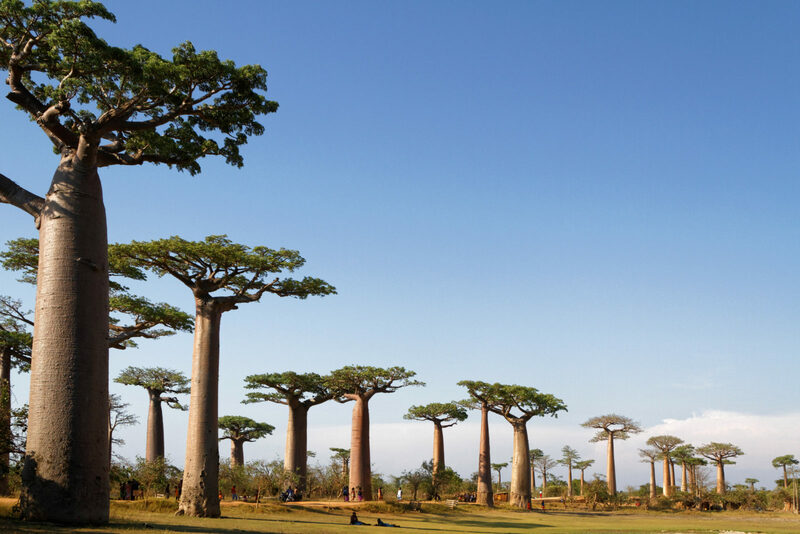 After breakfast you will travel to Belo Sur Mer along the scenic sandy road passing some beautiful baobab trees. Travel time 3:30-4:30. Belo Sur Mer is a beautiful fisherman village with stretches of white powder sandy beaches and turquoise blue waters of Mozambique Channel dotted with palm trees. The peaceful village is known pirogue and wooden boat building. Well worth a walk along the beach to see the village. This is a gem! 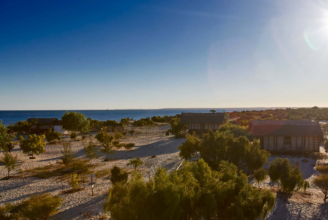 It is not a place you run into by coincidence - located at the remote seaside with the whitest sand, the bluest sea and the bluest sky you can imagine. After breakast, you will travel to Kirindy Mitea National park. Travel time 1:30-2 hours with picnic lunch. Kirindy Mitea National Park is an extensive with diverse wildlife. And it is a remote park and least visited. It is one of the largest deciduous forests with (722 km²). 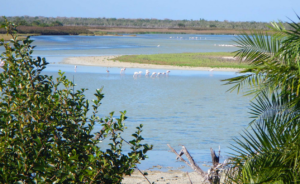 Due to its location, just at the point where the western and southern biotopes converge, visitors can explore tropical, dry deciduous and littoral spiny forest, coastal mangroves, grassy dunes, lakes, amazing beaches and coral reefs, all during the same day. 11 mammal species are found inside the park, including the Verraux sifaka, ring-tailed lemur, red-tailed sportive lemur and pale fork-marked lemur. Amphibians (10 species), reptiles (more than 20) and butterflies (90 species) are quite common. Apart from that, more than 50 bird species complete the richness of the land fauna. Some of them are very vulnerable such as pink flamingos, lesser flamingo, Bernier´s teal or Malagasy kingfisher. There are three baobab species, 7 mangrove species as well. The marine area includes 7 small islands. Today you will travel back to the highldands and will stop for the night to explore the charming city of Antsirabe. It is one of the most beautiful scenic routes in the central highlands. Antsirabe is the third largest city in Madagascar situated in the high altitude (about 1 500 m). The cool temperatures are in the high altitude the reason why the Norwegian Missionaries chose this city in 1872. Antsirabe is the home of one of the award winning best beers in Madagascar THB (Three Horses Beer). Its name means “where there is salt” honouring the large number of hot springs the town has, a fact that has given the city the nickname of “Malagasy Vichy”. The thermal baths had been long appreciated for their curative effects by the local population when French colonists decided to locate a thermal bath here in the 19th century. 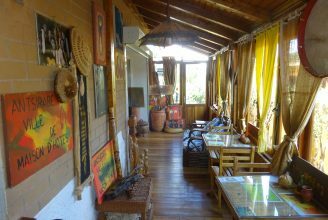 The common areas of the property are decorated in the traditional Malagasy style. 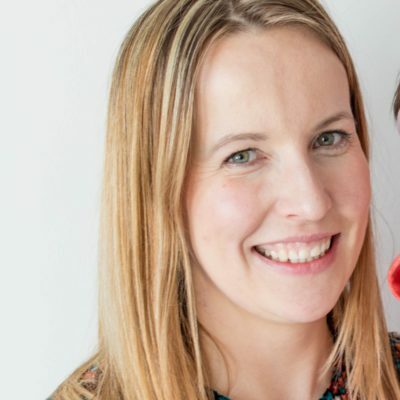 The staff will make you feel at home with helpful advice and a friendly approach. Before heading back to Antananarivo, you will have some time to explore Antsirabe city. You will take pousse-pousse rickshaw tour of Antsirabe to discover this interesting city mixed with architectural styles of the colonial and evangelical past. In the European district French cottage-style houses are built next to Scandinavian villas with English style gardens. The tree-lined avenues always give some freshness whenever the sun is too bright. You will reach Antananarivo for lunch time, afterwards you can have some time to rest or go for souvenirs shopping. 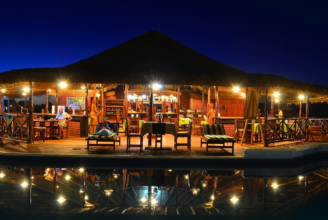 In the evening witness the best sun set with a Sundowner Dinner at Lakonga, Its best place to say cheers to great trip around Madagascar with glass of wine with a beautiful view of Antananarivo. And look back at the great times you had. Today you will be transferred to the airport for your flight back home. The travel time from your hotel is approximately 45 minutes to 1 hour depending on the traffic. 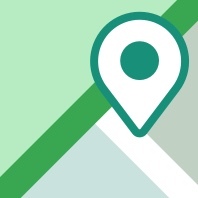 We can make this itinerary fully personalised and tailor every detail of it to match your interests and preferences.